This compact home amplifier is perfect for powering any stereo system. 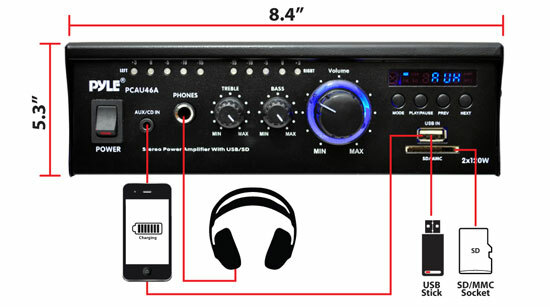 Complete with USB/SD memory readers, CD, & AUX inputs -- this simple to use and durable amp has, a slick blue LED display, L/R RCA inputs, and 4 push type speaker terminals. Using sophisticated circuitry and premium components for uncompromising musicality -- this product is famous for delivering powerful and accurate sound. Use the 3.5mm AUX input jack to connect additional audio devices including iPods/MP3 players. 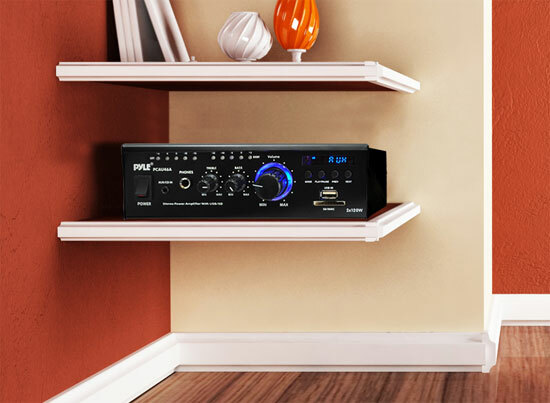 This small but powerful amp delivers clear and crisp audio for all of your audio needs -- separate treble & bass rotary control knobs for audio adjustments. Durable and affordable, this amp is made to last.